10/10 Must read book, so much more than you think!! 10/10 The sort of exercise I can relate to. 10/10 It's Never Too Late To Get Fit And Healthy! Danny explains everything, you need to know,about how to get strength in fast and simple way. 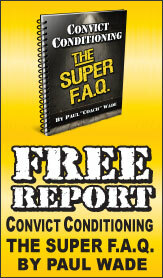 Book is compatible with beginners, and also with advanced athletes. full with great photos and perfectly designed. Convict Conditioning cannot be improved upon. Paul Wade should not have recommended "Strength Rules". I bought Strength Rules and I couldn't put it down. Fantastic book. It has got me hooked on sticking to bodyweight exercises. The reason I didn't give it 10 is because I think it would be good to have a link to some videos or more pictures of each stage for some exercises. Well great simplistic book that everyone likes to read, no jargon, and to the point lived it. I think very nicely point, with overall body importance exercises to undertake and straight forward nutrition.